Backyard chickens are found to be infested by a greater diversity of mites and lice than cage-raised chickens. Backyard chickens may not live as good of a life as many people think. Researchers at the University of California-Riverside (UC-Riverside) have found that backyard chickens are more likely than chickens on commercial farms to be infested by ectoparasites such as fleas, lice and mites that live on the exterior of an organism. Their work was published online Jan. 11 in the Journal of Medical Entomology. The research comes at a time when several states, including California, have banned or limited the use of isolated "battery cages" in favor of enriched cages or cage-free operations. The European Union has also banned battery cages, and a bill that would have banned those cages in the U.S. was introduced in Congress but failed to pass. The researchers — UC-Riverside graduate student Amy C. Murillo and professor of entomology Bradley A. Mullens — believe that these more open, cage-free or free-range type of habitats increase the risk of acquisition and transmission of ectoparasites. Such infestations increase stress on the chickens and may cause economic damage such as decreased egg production and feed conversion efficiency, the researchers noted. They also said there is no risk to humans who eat eggs or the meat of infested chickens. 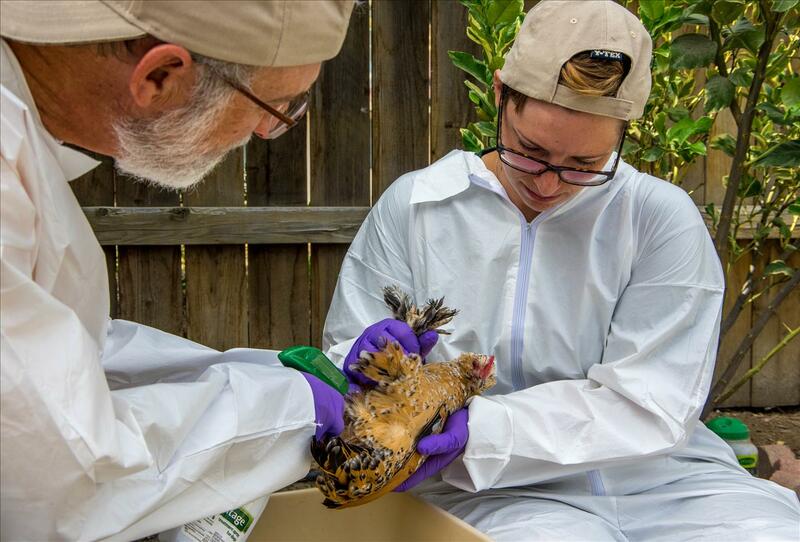 The researchers examined 100 adult hens in 20 different back yards in southern California and searched the birds and their coops for ectoparasites. They found a much greater diversity of ectoparasites on the backyard chickens than has been found in commercial flocks. According to Murillo and Mullens, ectoparasites were found on 80% of the flocks surveyed, and lice were the most common and abundant. Six different species of louse were found on the chickens, and some individual chickens had hundreds of lice. Sticktight fleas were found in only 20% of flocks, but infestations could be quite severe. The northern fowl mite was the most common mite, but the scaly leg mite and the chicken red mite were also found. Commercial poultry flocks suffer from a few of the same ectoparasites, but most commercial birds presently are housed in suspended cages that give them little or no contact with the ground or substrate that immature stages of parasites such as fleas and some mites need to develop. In addition, these cages provide fewer crevices that might harbor ticks or bed bugs when they aren't feeding on birds. Finally, birds in commercial flocks are generally all the same age and breed, which may affect the suite of parasites they host. The results of this study suggest that some of the perks of being a backyard chicken, such as comfortable coops and access to the outdoors, also increase the birds' availability to ectoparasites. According to Murillo, many of the chicken owners who participated in this study were surprised to learn that their chickens had ectoparasites, and almost none of the owners were practicing parasite prevention. With that in mind, she recommended that backyard chicken owners focus on preventing ectoparasite infestations because control products are limited. Chicken owners also should use biosecurity practices, such as excluding wild birds and other animals from coming into contact with the flock, limiting the addition of new birds to the flock, temporarily quarantining birds that are brought into the flock and limiting outsider visitation (many parasites can hitchhike on people or equipment). If chicken owners decide to use insecticides, Murillo said they should make sure to read and follow the label, noting that the label is the law and helps prevent unsafe insecticide exposure. If products not meant for use on laying hens are used, chicken owners risk exposure to insecticides when consuming the eggs or meat from the birds. The UC-Riverside researchers are working on further study of the ectoparasite community on backyard chickens in the U.S. in order to develop safe and effective parasite prevention and treatment techniques.